It's a common assumption, but there are other causes that are easily overlooked. distracted than most other kids his age. Maybe the child takes an unusually long time to finish schoolwork in class. Maybe when the teacher calls on him, he doesn't seem to have been following the lesson. Maybe he seems to tune out when instructions are given, or forget what he's supposed to be doing. Maybe homework assignments often go missing. While all children, especially those who are very young, tend to have shorter attention spans and be more distractible than adults, some have much more trouble focusing and staying on task than others. Since difficulty paying attention is widely associated with ADHD, that tends to be the first thing teachers, parents, and clinicians suspect. But there are a number of other possibilities that can be contributing to attention problems. To avoid misdiagnosis, it's important that these other possibilities, which are not always obvious, not be overlooked. A child who seems not to be focusing in school could have chronic worries that teachers (and even parents) are not aware of. There are many different kinds of anxiety, but what they have in common, says neurologist and former teacher Ken Schuster, Psy.D., is that anxiety "tends to lock up the brain," making school hard for anxious kids. A child with separation anxiety might be so preoccupied about something bad happening to her parents while she is apart from them that she is unable to concentrate on schoolwork. Some kids are extremely worried about making a mistake or embarrassing themselves. When the teacher is calling on them, they may try to disappear, Dr. Shuster notes. "They might look down, they might start writing something even though they're not really writing something. They're trying to break the connection with the teacher in order to avoid what's making them feel anxious." Sometimes when a child takes an unusually long time to finish her work in class, it's not because she's daydreaming but because she's, struggling with perfectionism that requires her to do things exactly the right way. Or if she doesn't turn in her homework, it could be not because she didn't do it, but because she is worried that it isn't good enough. Kids with OCD, which often starts in the grade-school years, have an added source of distraction: They not only have obsessive thoughts, but feel they must perform rituals, or compulsions, to prevent bad things from happening. A child with OCD might be compulsively lining things up on his desk, or tapping, or counting in his head. Or he might be focused on needing to go to the lavatory to wash his hands. "A kid may be sitting in class having an obsession about needing to fix something, to avoid something terrible happening. Then the teacher calls on him," says Dr. Jerry Bubrick, the senior director of the Anxiety and Mood Disorder Center at the Child Mind Institute. "When he doesn't know the answer to the question, it looks like he wasn't paying attention, but it's really because he was obsessing." Since children with OCD are often ashamed of their symptoms, they may go to great lengths to hide their compulsions while they're in school. To a teacher who's not aware of the OCD, distraction might look like ADHD, but it isn't. Children can also appear to be suffering from inattention when they have been impacted by a trauma. Kids who've witnessed violence or other disturbing experiences may demonstrate difficulty paying attention and a persistent sense of insecurity called hypervigilance. Kids whose home lives involve acute stress may develop these symptoms, or even post-traumatic stress disorder. "Many of the symptoms of PTSD look like ADHD," explains Dr. Jamie Howard, the director of the Trauma Response and Education Service at the Child Mind Institute. "Symptoms common in PTSD, such as difficulty concentrating, exaggerated startle response, and hypervigilance, can make it seem like a child is jumpy and spacy." When a child seems to be looking everywhere but at the pages of the book she is supposed to be reading, another possible cause is that she has a learning disorder. Children with undiagnosed dyslexia might fidget with frustration or feel ashamed that they can't seem to do what the other kids can do, and be intent on covering that fact up. If a child struggling with math, he might welcome distractions that allow him to think about something else, or avoid completing the assignment. 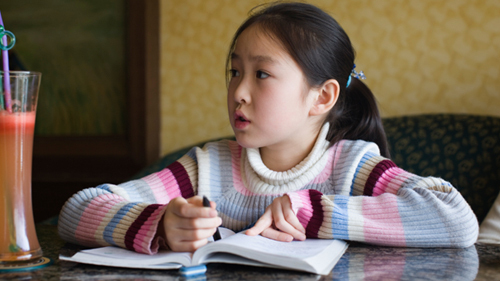 Auditory processing problems could cause a child to miss some of what the teacher is saying, even if she's listening, and that could look as if she's not paying attention. Some kids are able to compensate for their learning disabilities by working extra hard, and they may be successful until they reach a grade where the work becomes too challenging. "They've been able to hide their weakness until they get older and there's just too much heavy lifting," notes Dr. Nancy Rappaport, a Harvard Medical School professor who specializes in mental health care in school setting. "They're often diagnosed with ADHD or depression, unless someone catches the learning problem." Inattention that is outside the typical range is one of the three key symptoms of ADHD, along with impulsivity and hyperactivity. Some kids do demonstrate only inattentive symptoms. But a diagnosis of ADHD shouldn't be made just on the basis of teacher reports or one quick visit to the pediatrician. To make an accurate diagnosis, a clinician should collect information from several people who have observed your child, including you, other caregivers, and teachers. Parents and teachers should be asked to fill out a rating scale, to capture an accurate assessment of the frequency of symptoms. The behavior has to continue over an extended period, and be observed in more than one setting-both at home and at school, for instance. And, clinicians should carefully rule out other possible reasons for his behavior. It's also important that a child's ability to pay attention be compared to others of his own age, not everyone in his grade. A study published in 2012 found that boys who are the youngest in their class are 30% more likely to be diagnosed with ADHD than the oldest boys in the class, and younger girls are 70% more likely to be diagnosed than the oldest girls. This suggests that that immaturity may also be mistaken for ADHD.